SUGAR FREE CHOCOLATE - Finally, a way to indulge your sweet tooth without the guilt! 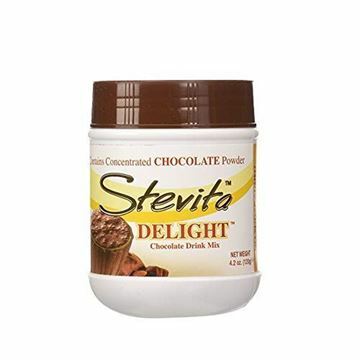 Stevita Delight is a delicious and healthy way to get your chocolate fix without sacrificing carbs, calories, and pleasure by combining rich cocoa with organic stevia. ', "LOW CALORIE - With just 13 calories per serving, you can enjoy more chocolate with less guilt. This rich, velvety cocoa mix is also low carb, gluten free, and kosher certified. It is also safe for diabetics, vegans, and those following the paleo or keto diets. It's also tooth safe. ", 'MORE THAN A BEVERAGE - While our drink mix is a great way to enjoy an instant and guiltless hot chocolate (just add milk,) its also a great additive to oatmeal, cereal, smoothies, whipping cream, yogurt, and even your coffee. You can also use it to create chocolate desserts. ', 'PACKAGED FOR FRESHNESS - Our air-tight jar makes it easy for you to measure stevia for recipes and as a sweetener for coffee, tea, and smoothies. ', "TRUSTED NAME - Stevita introduced the world's first tabletop stevia in 1988"
SUGAR-FREE SWEETENER - Velvety-Smooth Blend of Organic Stevia and Erythritol is meticulously crafted to taste like sugar with no bitter aftertaste. Our 0 calorie sugar substitute is 4 times as sweet as sugar, meaning you use much less, making it an exceptional value. ', 'ALL NATURAL - Our blend contains no artificial sweeteners. Our Stevia is 100% Certified USDA Organic, Fair Trade, and Non GMO. It is also Gluten-Free and Kosher Certified and is safe for Diabetics, Vegans and those following Paleo or Keto Diets. Our Stevia is also Tooth Safe. ', "SUSTAINABLY SOURCED - All our stevia comes from the plant's natural habitat in southwestern Brazil. Our products contain no artificial fillers. ", 'PACKAGED FOR FRESHNESS - Our economical 16 ounce, air-tight jar makes it easy for you to measure stevia for recipes and as a sweetener for coffee, tea, and smoothies. 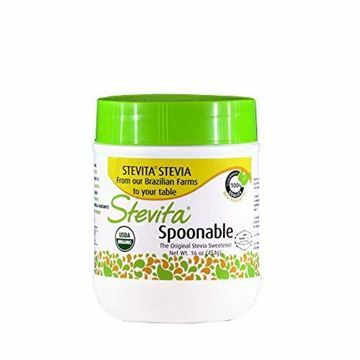 ', "TRUSTED NAME - Stevita introduced the world's first tabletop stevia in 1988"